In an era of unprecedented exponential technology growth, here’s a statistic that at first glance may shock: only 15% of companies have changed their business models to adapt to the digital age*. According to Leading Digital, the new book from Capgemini’s Didier Bonnet and MIT’s George Westerman and Andrew McAfee, there are now five major business model archetypes from which companies can draw inspiration, but many are still languishing in the ‘disappointment’ phase, where lack of tangible progress can lead them to lose heart, before they hit the real results. With rising customer expectations and unsurpassed levels of competition as agile market entrants break new ground, it’s more important than ever before for companies to consider how best to align this exponential technology growth with growth plans, simply to stay in the game. 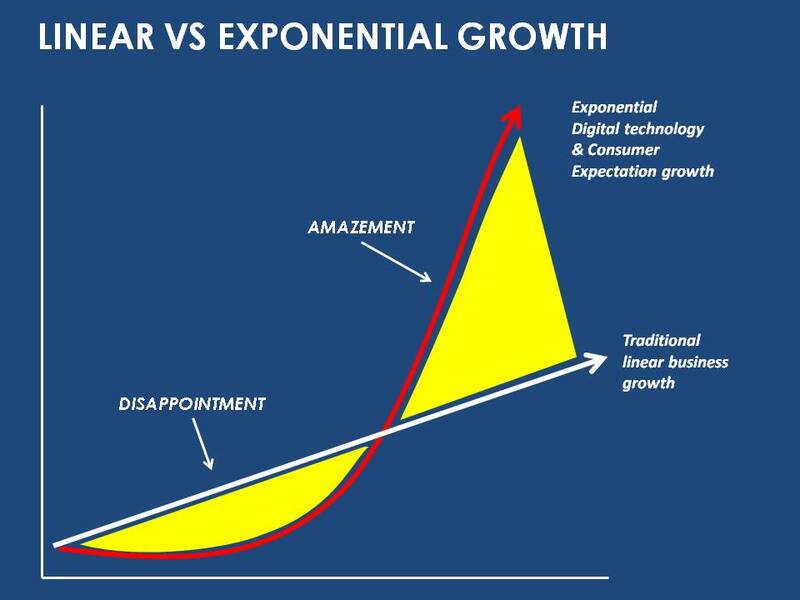 If we consider the above graph, we can see that perhaps the moment where exponential growth takes over from linear growth is the most dangerous of all. This is where energy, belief and progress can stall, because the ‘amazement’ breakthrough hasn’t yet been experienced. Since every company will undoubtedly go through a disappointment phase as they gear up for digital, how can they ensure that momentum is not lost and that expectations for growth are aligned with the technological reality? Leading Digital explores the specific capabilities that digital leaders have invested in, to maximize on digital channels for differentiating customer engagement, operational excellence as the competition hots up and shaping a business model that has staying power for the new digital age. The authors outline some key considerations and factors for success that they have observed in current marketplaces, the world over. But perhaps most fascinating in this context is approaches to adapting the business model. You’ll recall I referenced earlier the five key models for the new digital economy outlined in the book. In some ways, this is the toughest part, but also the factor that has greatest potential to make or break a company’s digital success. It’s in this content that we see true disruption—consider how Uber has reinvented the cab industry, for example—as well as new ecosystems, delivery models and value propositions. We also see radical shifts; companies whose core products have been replaced by digital technology. A prime example is Singapore’s SingPost, where we witness the most traditional of services transforming with the digital age. Evolving from post office to logistics provider, SingPost has embraced digital technology across the board, notably by becoming a majority investor in an e-commerce startup which designs a wall-to-wall platform covering engagement, content and commerce. By selling this platform to its business customers, coupled with its own logistics services, SingPost clearly demonstrates the gains to be made, by thinking beyond the traditional and linear. Other giants such as Unilever and LG are also embracing startups in their quest to revitalize the business model and align growth with technology. The key, it seems, lies in embracing agile, non-linear startup thinking and applying it to an established business. Easier said than done, but it’s clear that whatever the industry, whatever it’s facing, standing still simply isn’t enough.